TORONTO - The need for respite and relaxation was a central theme in Soia & Kyo's latest collection as the Montreal-based brand unveiled laidback looks for those seeking a retreat from life in the fast lane. "It's basically urban styles versus country comfort," creative director Ilan Elfassy said backstage at Toronto's World MasterCard Fashion Week on Thursday. "It's all about escape from the city, from the busy lifestyle to a park to enjoy the weather." 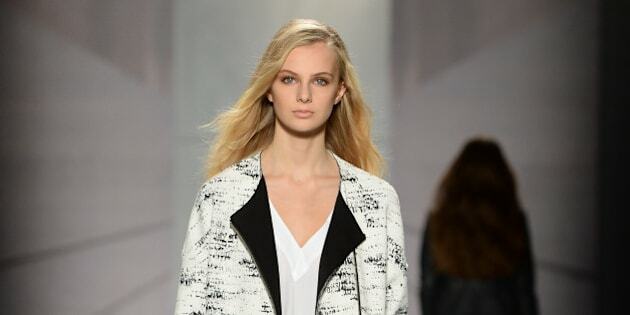 With separates largely bathed in neutral hues, colourful outerwear was the featured attraction in the new line. There was a novel mix of moto-style vests, draped coats, trenches and bomber jackets along with flashes of floral print etched on the inner lining of coats. The collection balanced softer, muted tones with bolder infusions of dusty rose and yellow. — Follow @lauren_larose on Twitter.